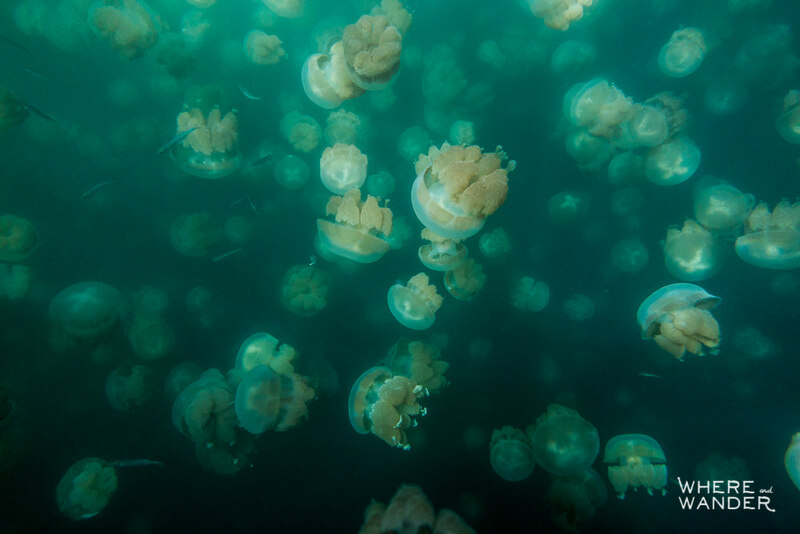 The very idea of swimming in a body of water surrounded by an endless swarm of jellyfish is something that might send shivers down the spine most of people, and that same idea is precisely why I flew all the way out to the remote islands of Palau. I’ve been stung by a few jellyfish over the years and it is not fun. And no, I’ve never peed on myself after being stung…or have anyone else pee on me…that I can’t remember. 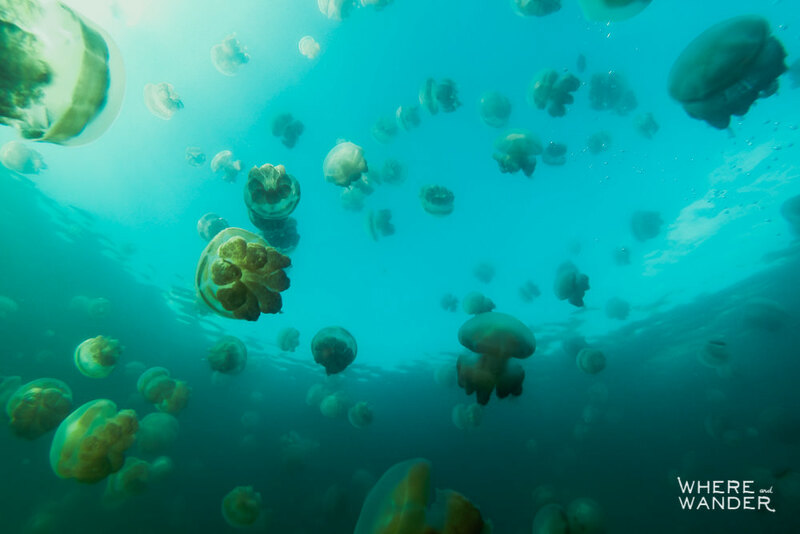 What made this an instant bucket list item for me was finding out that there was a lake in Micronesia where you can swim with a million jellyfish that are completely harmless to humans. It’s absolutely insane and I had to experience it myself. 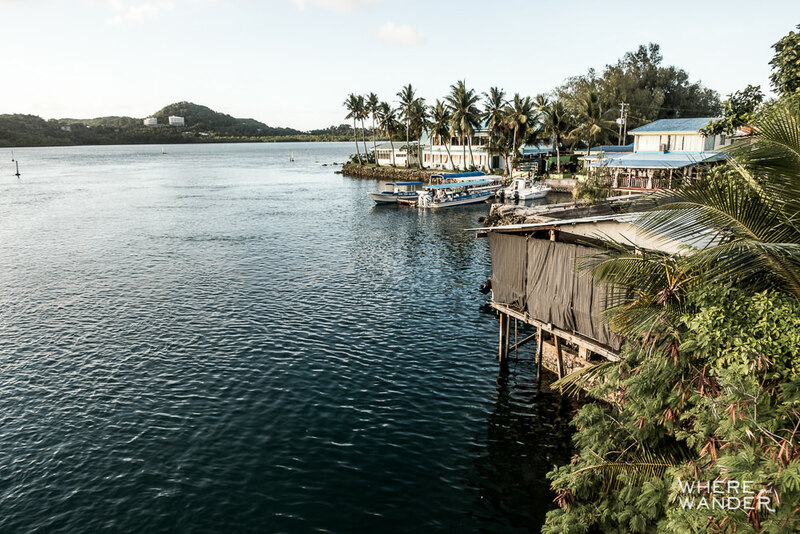 You can fly commercially to Koror, Palau (ROR) from one of 5 places: Guam (1.5 hrs), Manila, Philippines (2.5 hrs), Taipei, Taiwan (4 hrs), Tokyo, Japan (4 hrs), and Seoul, Korea (4.5 hours). Coming from San Francisco, I decided to stop by Tokyo for a week first because sushi, sushi, and sushi. You can get a 30 day visa on arrival (1 year for US citizens), so that was one thing I didn’t have to worry about. The airport is about 5 miles away from Koror (where you’ll want to stay), and costs about $20. Most flights arrive at night, so it’s best to arrange a pick-up with your hotel before arrival. Grabbing a taxi isn’t that difficult either. 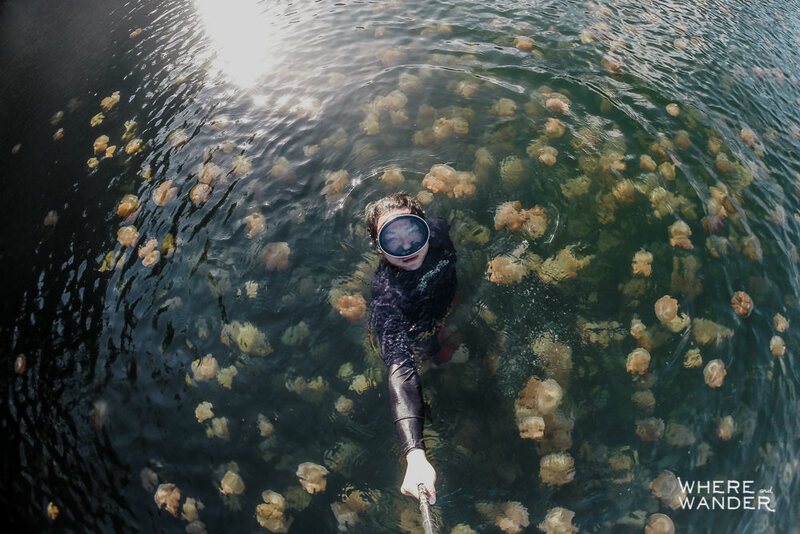 Once you’ve settled in, your hotel can probably arrange for you to be on one of the tours heading to Jellyfish Lake. 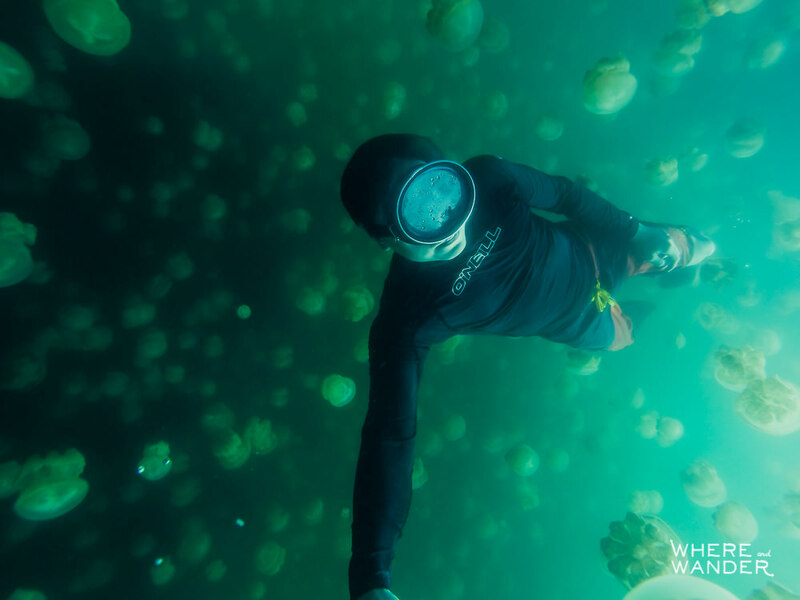 These tours usually combine the Jellyfish Lake as part of a snorkeling or kayaking trip around the Rock Islands, Palau’s main attraction. 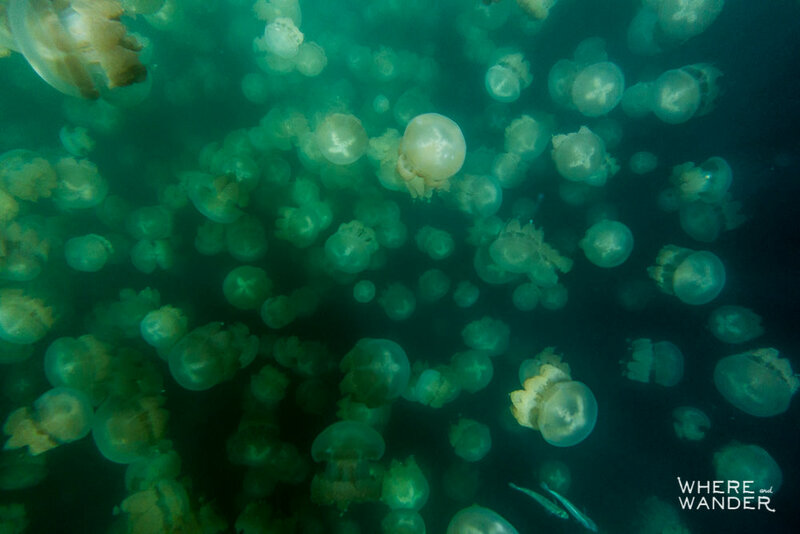 Likewise, dive shops can arrange a trip to Jellyfish lake as well. Either way, you can’t just go on your own. 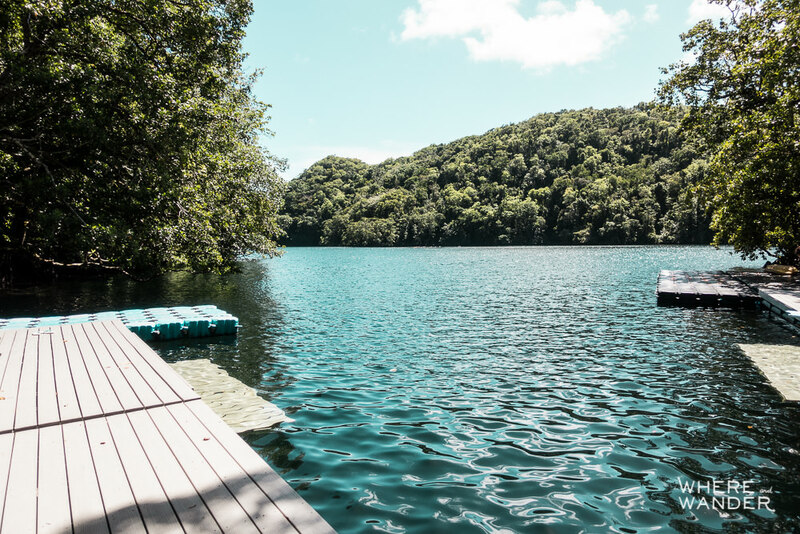 Prior to heading out, you’ll also have to pick up a Palau Jellyfish Lake and Rock Islands permit. This will cost you a $100. It’s steep I know, but better you know ahead of time. With the logistics out of the way, all that’s left is to pack a pair of swim trucks and prepare to have your mind blown. 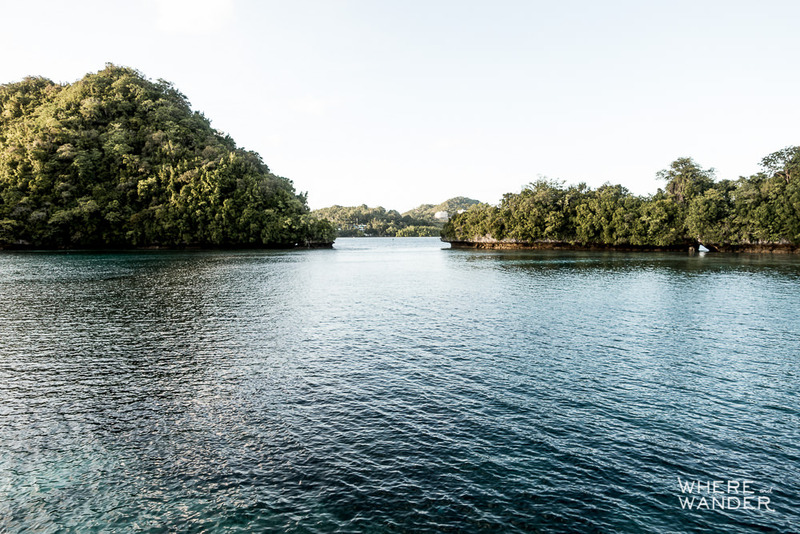 *Note: The next couple of paragraphs are very logistical to help you plan your trip to Palau. Skip it if you just want to get to the pretty pictures and my read about my experience. Short answer: No. Long answer: Noooooo. 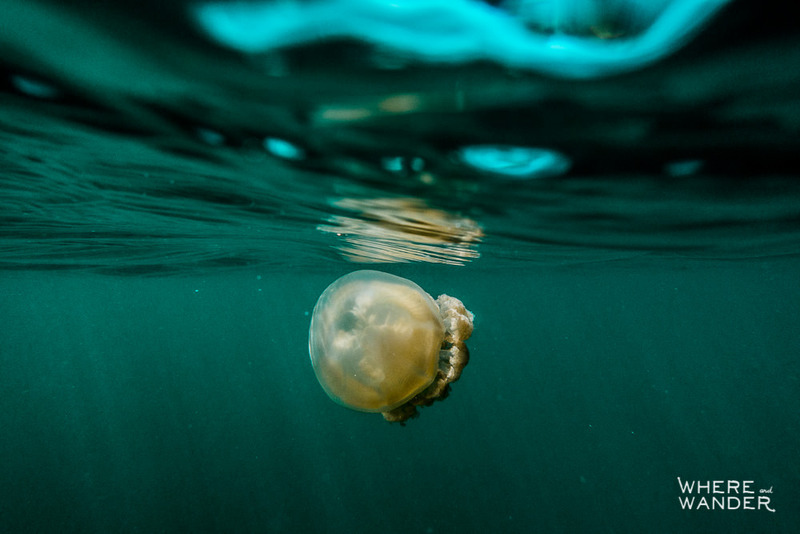 The jellyfish in the lake have been isolated so long without a need to use their stingers that they have evolved to lose them. Instead, they feed on the algae in the lake. If anything, we are potentially the danger to them as tourists recklessly flop about with their fins kicking into their delicate composition. It’s safe to go into the water, except for the saltwater crocodiles. Just kidding, those guys hide in the mangroves outside the lake. You’re good. Palau is not the cheapest destination so I stayed at one of the cheapest place I could find, Ms. Pinetree’s Hostel. This turned out to be one of the best decisions I made on the trip. The family-run hostel is basically a house with 4 rooms (2 dorms and 2 private rooms). They also offered their own tours that were cheaper than the other tour operators and the genial older gentleman who takes you out (Francis) also happens to be the guy who discovered most of the dive site on the island. On my dive trip with them, it was just me and a couple also staying at the hostel. This was truly a hidden gem. Not only was the group smaller and more private, it was cheaper than all the other dive shops. 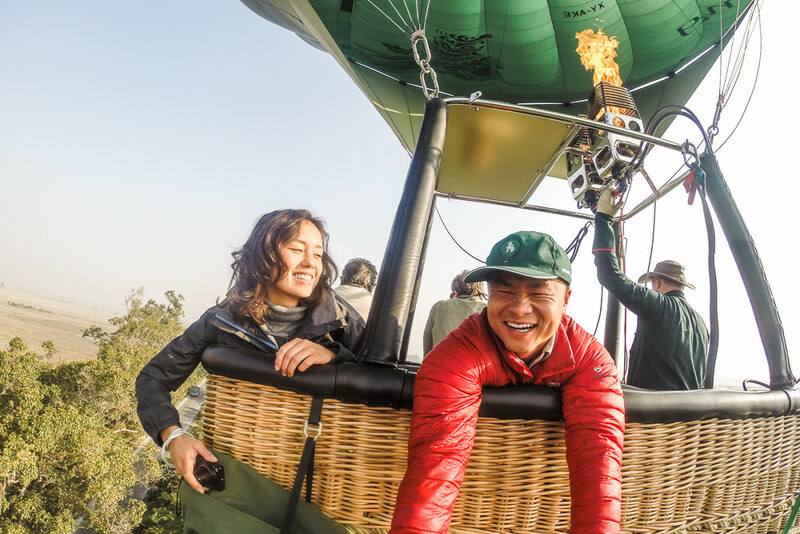 When I arranged for a day trip around the Rock Islands and Jellyfish Lake, it was just me and my friend AND we were able to customize the trip to go to less frequented sites and at times when he knew the other hordes of tourists weren’t there. I simply cannot recommend them enough. On Sunday, I even came down early into the living room to watch some football. It really felt like being at home, except I was in paradise. We checked out a few spots before getting to Jellyfish Lake including a few wrecks. I’ll talk about that in a separate post about exploring Palau’s underwater world. This is all about the jellies. Sometime in the early afternoon, we arrived at the pier leading to the lake, grabbed our gear and checked in with the guards who made sure that we had our permits. I took along my trusty GoPro and my main underwater camera, the RX100 IV in my Nauticam Housing. Make sure you have a pair of sandals because there’s a pretty steep and rocky 10 minute hike to get to the lake itself. At the lake, there’s a little dock where you can leave them there. The photo above shows what it looks like when you arrive. It’s a pretty big lake and the jellyfish are constantly moving to follow the sun and their food source. On most tour groups, you’ll jump in with your life vest and follow the guide until he finds the swarm. We opted to do this part alone, so we basically just started swimming out to where there we saw a tour group leaving from. 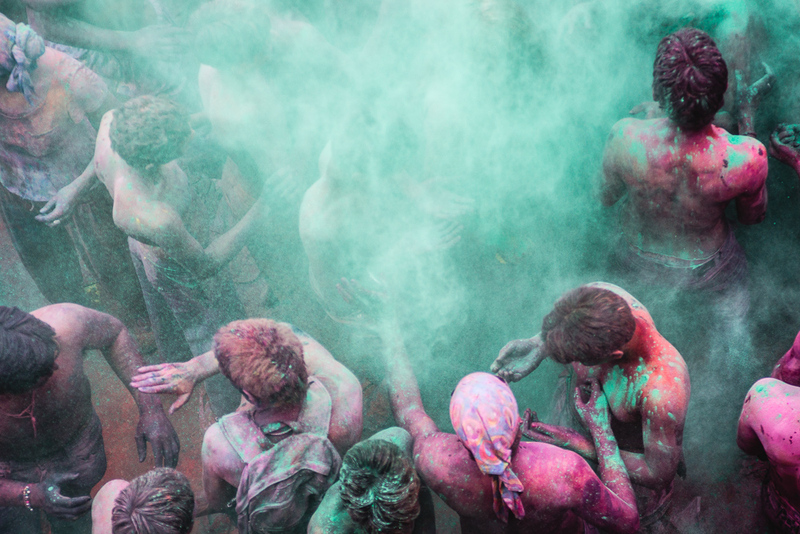 Despite seeing the photos before arriving, I still had no idea what to expect. On the way out, we saw nothing and I was a little nervous that we might not find them without a guide. That worry soon disappeared as I saw my first jellyfish. And then another. And another. I was already pretty excited at this point and it kept getting better. 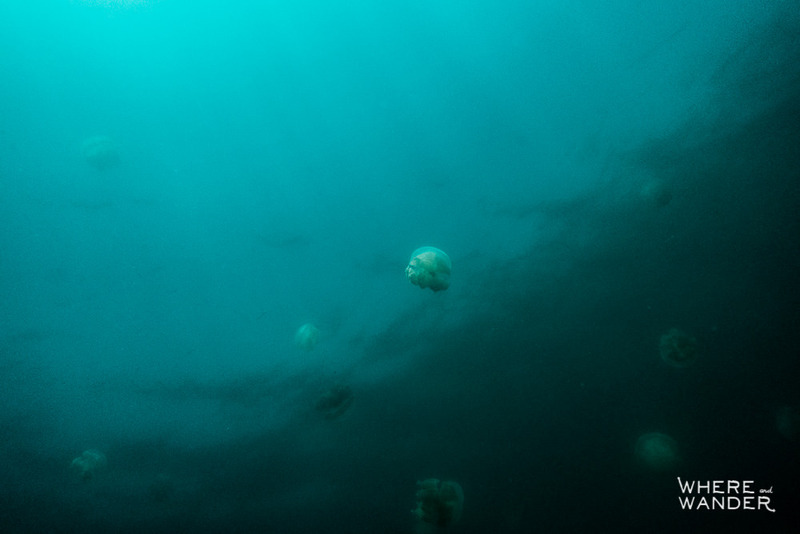 We stumbled into the right spot and soon enough those 10 jellyfish were joined by a few hundred and then just like I had seen, I was surrounded by thousands and thousands of jellyfish in every direction. It was stunning beyond belief. 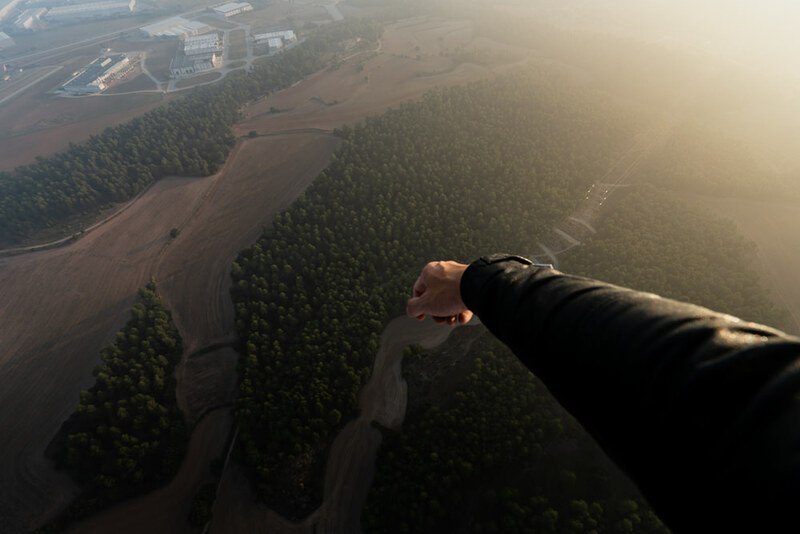 I would take a deep breath and dive down as long as I could coming up only when I knew I couldn’t stay down any longer. I’d gasp for air and repeat the process. It was magical. When I’m surfaced, it’s quite funny to feel them bouncing and bobbing off my body. I try to kick as gracefully and carefully as I can since I have no idea how many of them I’m kicking down below. The surreal part is that for as many as you see on the surface, the numbers multiple the deeper you go. And I kept going deeper and deeper each time. There were big bulbous ones and small ones that were tinier than a finger nail. Unlike swimming through a school of fish, they did not part and you simply bumped them out of the way with your face and body. As it got darker, they almost glowed against the water, suspended but for their rhythmic pulsing as they moved in all directions. On one particular dive, I started spinning and turning as I was going down to just immerse myself in this unbelievable place. I lost track of time and soon after place. The deeper I went, the greener the water became until all I saw in every direction was green and of course the jellyfish. I don’t know how deep I went, but I felt like I had passed some invisible barrier and was somewhere else. It took a few seconds (it felt much longer), but eventually I turned enough to see a brighter area and started swimming towards that light. Coming up towards the bluer water, I felt both a sense of relief and an unexpected nostalgia already that I might never be in that space again. When I came up, I realized thatthe entire lake was empty except for the two of us. From what I had read about the hordes of tourists coming in here, I never imagined that I could have the place practically to myself. 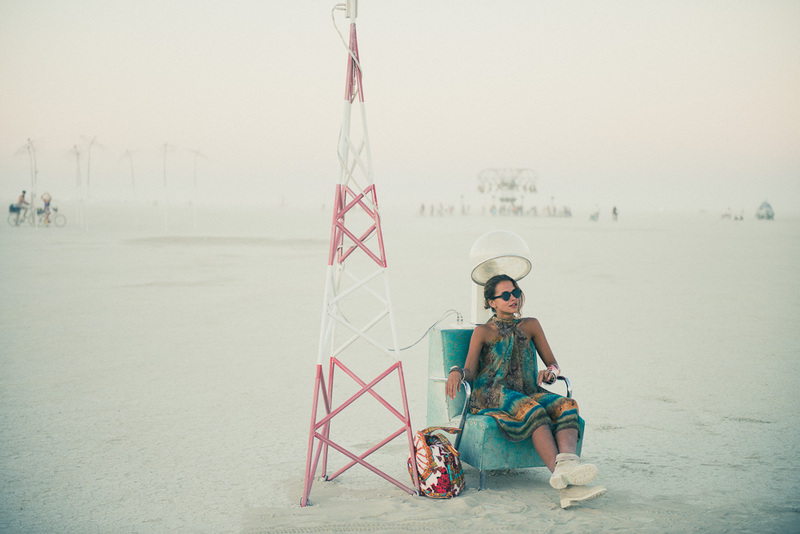 We spent about an hour there before deciding that it was best to leave before we were oversaturated by the experience. 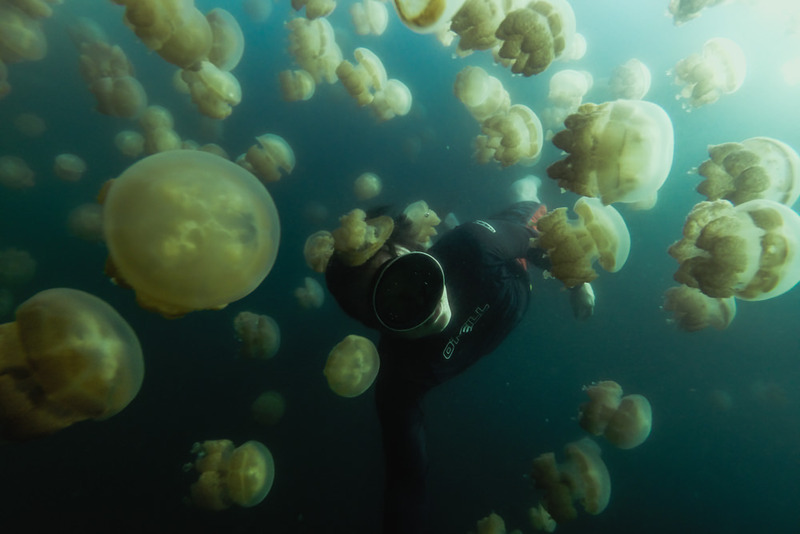 This was definitely a bold check next to “Swim With A F*ck Load Of Jellyfish.” on the bucket list. I’m sure like most, Palau made it onto my radar because of Jellyfish Lake, but this is not the only thing they’re known for. The diving and snorkeling here is spectacular. Because they only so many tourists a year, the natural part of is very much untouched. Check back soon for a more detailed post about all the other things you can do on Palau. Or better yet, subscribe to my mailing list and you’ll get notified when another post goes up. Watch my film of the experience below.